Disabled youth Jeff Erlanger met Rogers in Milwaukee, is featured in new documentary. Jeff Erlanger and Mister Rogers on Set – First Aired in 1981. Jeff Erlanger was a devoted Milwaukee Brewers fan growing up. He watched as many games on TV as he could. But because he was a quadriplegic, he couldn’t dress himself. So Jeff’s father Howard Erlanger played a game with his son as he dressed him. Who is the centerfielder for the Brewers? Gorman Thomas, yes, that’s right. Now we’ll put on one sock. 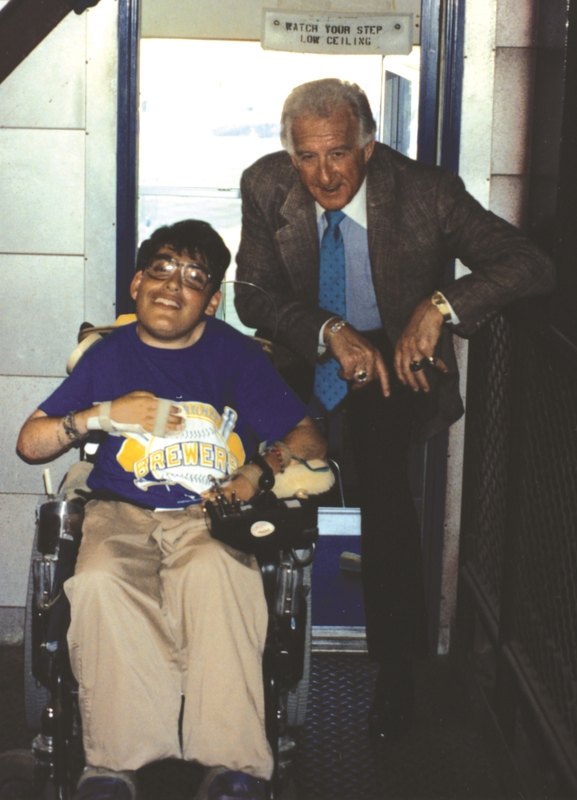 Jeff Erlanger with Bob Uecker. Jeff grew up in Madison with his parents, Howard and Pam, and his older sister Lisa. Like many kids in the 1970s, Jeff loved watching the television show Mister Rogers’ Neighborhood. He would watch the show two times a day, once on the Milwaukee PBS station and once on the Madison public television station. They expected their son to ask to go to Disney World. Jeff told them he wanted to meet Mister Rogers. Jeff Erlanger and Mister Rogers first meeting in Milwaukee. Jeff’s parents sent a letter to Fred Rogers at the station WQED in Pittsburgh where he filmed his show to explain the situation. They got back a personal letter, written by Fred Rogers himself, typewriter edits and all. He told the Erlanger family that as luck would have it he was heading to Milwaukee to do a promotional event with the Milwaukee PBS station. If they could make it from Madison to Milwaukee, Mister Rogers would be able to meet Jeff. Mister Rogers had time to meet the whole Erlanger family for breakfast. 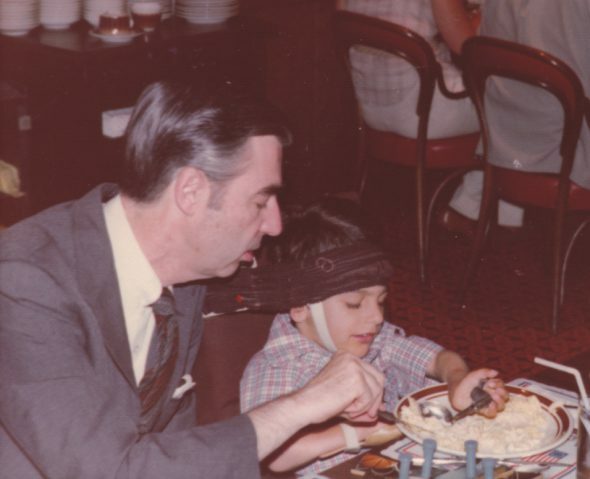 Jeff could feed himself but with some difficulty, and when Mister Rogers saw Jeff struggling with his scrambled eggs, he said, “Oh why don’t you let me do that.” Fred Rogers asked Jeff’s parents to switch seats so he could sit next to Jeff to help him, and the two had an immediate connection. It was more than five years after meeting in Milwaukee that Jeff and Mister Rogers made television history. 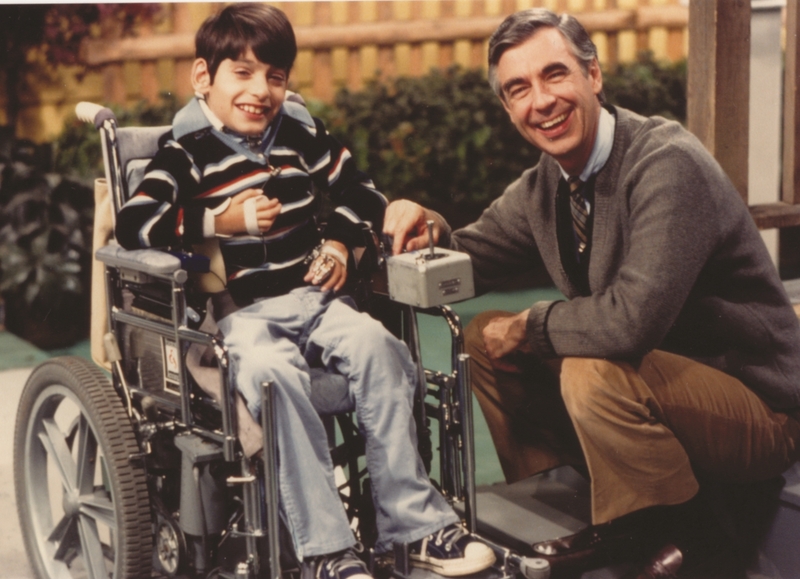 Mister Rogers’ Neighborhood was doing a show on electric vehicles, and Mister Rogers remembered Jeff and wanted him to show off his electric wheelchair on TV. But because they’d met in Milwaukee, Mister Rogers’ staff looked for an Erlanger boy in Milwaukee and they couldn’t track down Jeff. Fred Rogers’ staff wanted to know: Can’t we just get a cute local kid from here in Pittsburgh? Mister Rogers replied, “Nope. We’re not doing it until we find Jeff!” Eventually a staff member stumbled upon an old letter from the Erlangers with the Madison address and they got in touch. So the Erlangers went to Pittsburgh, and in 1981, when Jeff was ten-years-old, his appearance on Mister Rogers’ Neighborhood was broadcast across the country. After Jeff showed Mister Rogers how his chair moved and explained how he became handicapped, Mister Rogers invited Jeff to sing “It’s You I Like” together. Mister Rogers had knelt down so that his eyes were level with Jeff’s, and with their faces just a foot apart the two of them sang. Almost two decades later, Fred Rogers was inducted into the Television Hall of Fame in 1999. Jeff flew to Los Angeles to invite his old friend Fred on stage to receive this great honor. Everyone kept Jeff’s appearance a complete secret so that when Fred Rogers saw Jeff come on stage it was a real surprise. Mister Rogers always appeared in front of children with a serene happiness, a calm and pleasant smile. But when he saw Jeff come on stage, the joy on Mister Rogers’ face was that of a little kid meeting his hero or seeing a long lost friend. Mister Rogers leapt out of his seat like Roberto Benigni winning an Oscar. Fred Rogers died of stomach cancer in 2003 at the age of 74. At his memorial service at Heinz Hall in Pittsburgh, there were three main speakers: Yo-Yo Ma, Itzhak Perlman, and Jeff Erlanger. Jeff died in 2007 at the age of 36 from respiratory complications. Jeff lived a full life. He went to college and was an advocate for the disabled. He ran for the Madison City Council. He had a smile that somehow seemed wider than his entire face. Howard Erlanger calls his son Jeff “one of my favorite topics” and says, “It’s a life to celebrate, not a life to mourn. He had a really full life, and meeting Mister Rogers was this incredible moment in his life that affected him.” It affected millions of other people too. The documentary Won’t You Be My Neighbor? is currently showing at several Milwaukee theaters. It includes scenes from times when Mister Rogers and Jeff Erlanger met as well as interviews with Jeff’s proud parents, Howard and Pam Erlanger. Is there a comma missing? I vote for comma after Erlanger, but forgive most transgressions in headlines. Punch Up! Don’t Punch Down! 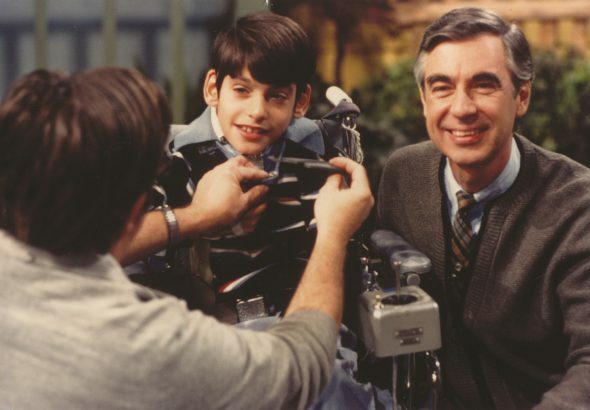 Insisting on interacting with Jeff Erlanger (on the part of Fred Rogers) because he had a special connection with him made the show authentic for the rest of America’s populace and taught children that being friends with a disabled child that they liked was a good thing to do!